Have you been pounding the streets for miles, in all weathers? Is your diet is carefully planned and all your spare time spent training? Have you had a pre-event massage to loosen up and boost your performance? After months of hard work, you’re ready for your long distance race and your marathon is almost here. Make sure you eat plenty of carbohydrates the day before. Aim for 65-70% of your total calories that day to be from pasta, potatoes or other high carb foods. Now is not the time to try any new foods or free treats. 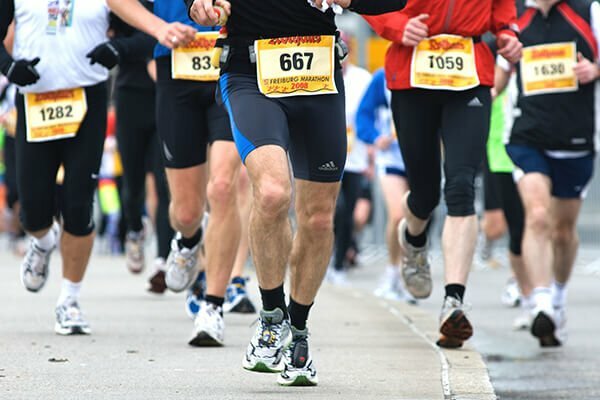 Stick to what you know and avoid any unwanted stomach issues on your marathon day. Make sure you drink plenty of water the day before. If your urine is pale yellow this means you’re on the right track and hydrated. Avoid alcohol as this will dehydrate you making you more susceptible to injuries. You can celebrate after the race! Don’t overdo it the day before. You’ve done all the hard work now is the time to rest and relax, your muscles will thank you. If you must do something the day before your marathon or half marathon just go for a gentle 20 minute run. This will keep you loosened up and help with any last minute nerves. Enjoy this run – remind yourself that you’ve completed all your training and that this run is just for fun. Give them a quick check and trim if needed to prevent any discomfort or black toenails. Get out all the clothes the night before so that’s one less thing to worry about in the morning. Don’t forget those socks, gloves, headband… whatever it is you need, get it ready now. Don’t forget any energy gels, your race bib, safety pins and now is the time to charge your fitness watch too! Well done to you all for putting in such hard work for your training. Enjoy your big event, you’ve worked hard for it so make the most of it! Remember – a post event massage will help your recovery after the race. Call us on 01462 811006 to book your appointment. What’s the Best Exercise for Back Pain? If you’ve come to this website looking for help, then don’t in silence suffer any longer. Contact us immediately on 01462 811006 for a consultation and let’s assess your condition. At the assessment, we’ll take some details from you and build your case history. We’ll discuss why you’ve come to see us and where you have any aches and pains. Then we’ll examine you with the aim of giving you the appropriate treatment. This will take a little while to complete, but it’s a necessary part of the ethical guidelines we work to. The guidelines are there to make sure everything is done professionally and to a high standard of patient care. I’m sure you agree that’s a good thing! If you have any questions about what we do and how we do it, call us on 01462 811006 or use the contact form below – and we’ll be happy to help. Here at Shefford Osteopathic Clinic we can treat a wide range of conditions. Select a green link from the list below to find out more. © 2019 Shefford Osteopathic Clinic & Licensors. All rights reserved.